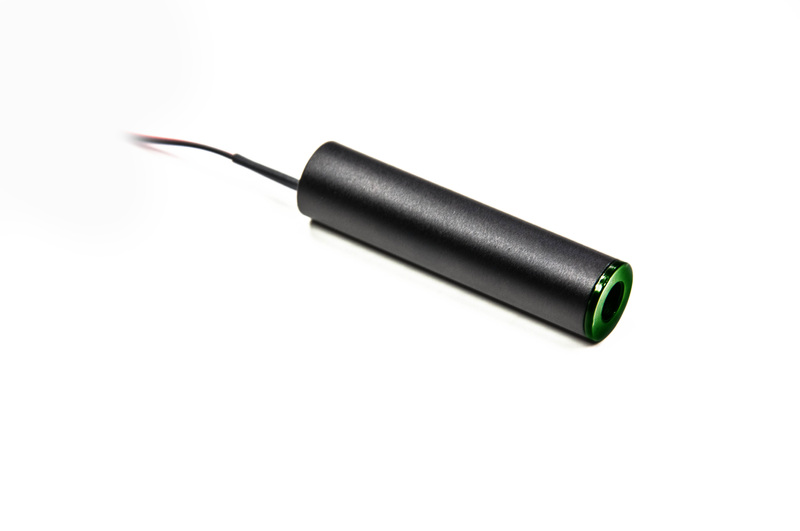 Green & Blue laser modules with Photodiode feedback. Industrial Quality. The CPD Series laser modules are designed expressly to host laser diodes that do not have their own internal photodiode. The CPD overcomes this challenge by integrating an internal photodiode after a collimating lens. This configuration allows for Automatic Power Control (APC) mode of operation. APC Control is not available on a majority of competing DPSS lasers at these wavelengths. The stability of this configuration cannot be matched by inexpensive DPSS lasers. The CPD module operates on 5 VDC, unlike the 8 VDC GPD module. The CPD module can deliver from 1 mW to 50 mW of output power with a wavelength of 405 nm to 520 nm. Additional design features include great wavelength stability, excellent optical power stability, and CW output. Output power is adjustable by turning a potentiometer on rear of the unit.